This cat is sleeping and having a nightmare. You have to help him to find an exit from there. To do it you will have to overcome a lot of interesting levels with a lot of obstacles and traps. Don’t forget to collect coins to reach success. 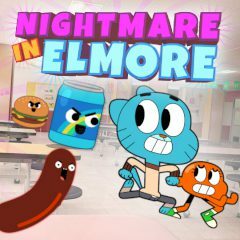 If you like adventure games, this game developed by cartoon network is made for you. You have a chance to travel in a cartoon world and help this kitten to in his adventures in the nightmare. You must pass a lot levels, run, jump and collect cons. Try to not fall or you will die. You have only three lives so you must be very attentive and quick. There is a lot of interesting levs in this game. The difficulty of levels will grow with tout progress, SO you will have to use all you abilities and skills to pass them all. Are you ready dot the breathtaking adventures. This little kitty is already waiting for your help. Are you read to show him the way from a nightmare? Good luck and have fun!